It is my humble opinion that raising backyard chickens is one of the easiest and most fun steps that we can take towards self-sufficiency. 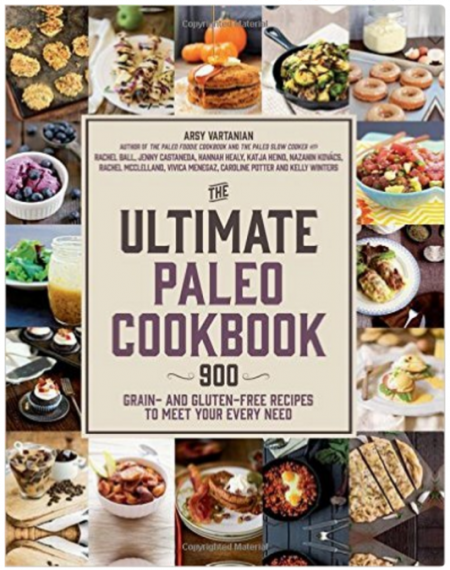 Taking control of where our food comes from is liberating and empowering. And raising backyard chickens comes with some awesome perks. 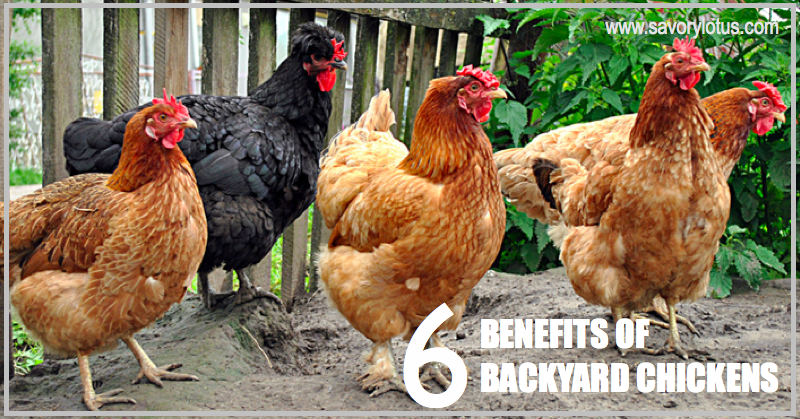 Let’s talk about 6 Benefits of Backyard Chickens. 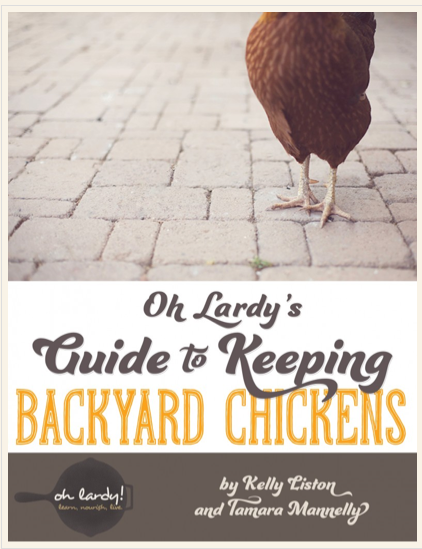 Have you been thinking of getting some backyard chickens? It’s becoming more common for folks to have a few chickens running around, producing fresh eggs daily. The more of our own food that we produce, the less we have to rely on a food industry that puts profits over health. Plus it seems that it’s pretty hip to have chickens these days, right? Have you ever wondered what all of the labels on egg cartons mean? Free range. Cage free. Antibiotic free. Vegetarian feed. 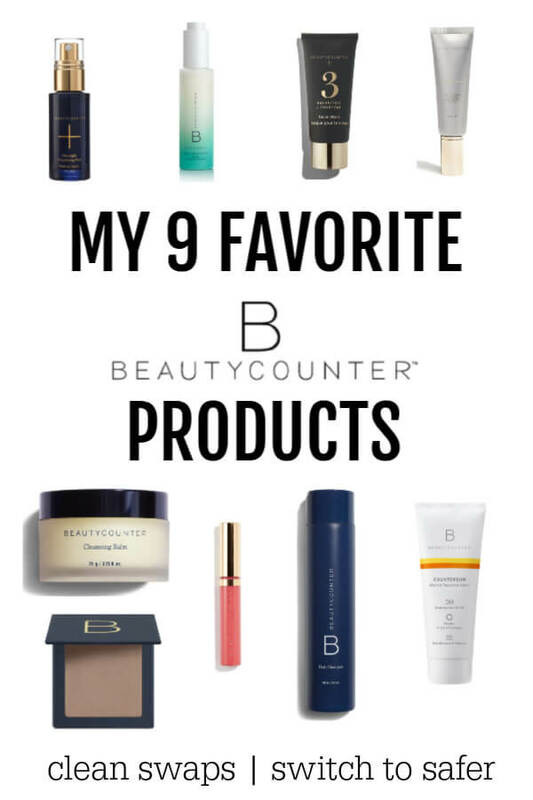 It’s really all hard to decifer. The majority of the eggs that are sold in grocery stores are produced in factory-farm battery cage operations. This not only produces an inferior food product, but is also an incredible cruel and sad practice. You don’t even want to know what those chickens are fed. Can you say GMO? Raising your own chickens will guarantee that you and your family are getting good, quality clean eggs. There is no comparison when you experience fresh, organic eggs from happy chickens who are allowed to forage and roam and are fed a GMO-free diet. Chickens love to forage on snails, slugs, crickets, ticks, termites, caterpillars, worms, slugs, fly eggs and pupae, beetles, weevils, spiders, centipedes, and grasshoppers. This is good news for you in the garden. Natural pest control! Hate pulling weeds? Chickens also love to eat weeds, making clean up in the garden a breeze. Chicken poop is like gold to any gardener. It has high levels of nitrogen, phosphorus and potassium and is more more economical and earth-friendly than synthetic fertilizers. Toss it into your compost pile and you are all set to grow! One of the most valuable life lessons we can teach our children is where our food comes from. Making the connection and learning to source our own food is empowering and amazing. There are many valuable lessons around responsibility and respect for animals that can be learned from raising backyard chickens. Admit it, chicken are cute. They all have their own little personalities. There are some really interesting-looking chickens out there. It’s fun to watch them go about their day. Children love to play and care for backyard chickens. Your neighbors may get curious and want to come by to look. 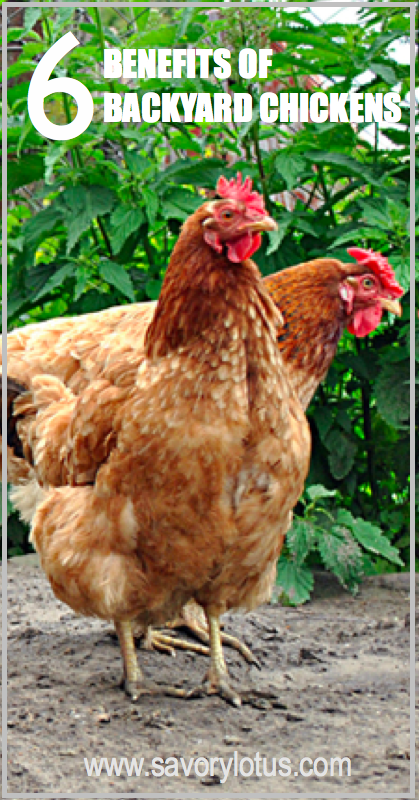 All in all, backyard chickens can be a fun and rewarding adventure. 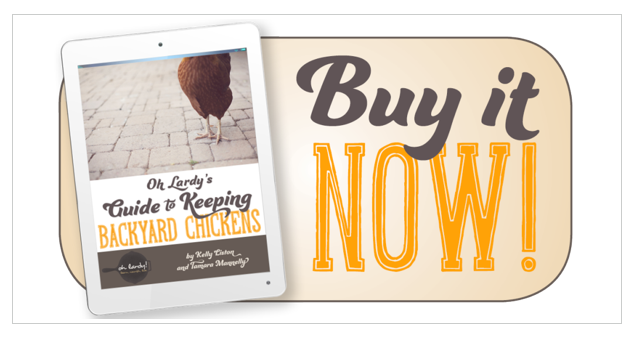 My favorite resource for backyard chickens is the Oh Lardy’s Guide to Keeping Backyard Chickens. It’s a beautifully written guide to chickens for anyone who is wanting farm fresh eggs in their own backyard. Many of us are wanting to take control of where our food comes from. We are tired of poor quality grocery store eggs. But maybe we just don’t know how to get started.